Eutelsat Hotbird is 13B is a powerful TV satellite offering a lot of television services and other direct to home TV service across the world and is located at 13 degrees East. Hot Bird satellite has extended footprint coverage map over Europe, North Africa and the Middle East. Hotbird sat provide hundreds of Television and Radio channels in both free-to-air and encrypted type modulation. The Hotbird satellite series currently operate at 13 degrees East and are named as 13B, 13C and 13D. Hot Bird is currently offering TV channels from across the world and this TV satellite is also well known and popular for its adult TV services as there are many popular adult TV channels on Hotbird. 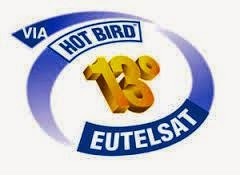 Here is a complete list of TV channels of Eutelsat Hot Bird 13B, including free to air TV, Pay channels and adult TV channel list of Hotbird. Frequency with symbol rate and modulation. Channel from China in English. HotBird Adult TV channel List. Channel from Iran in Spanish. Russian news channel in English. HD version of a Disney Channel. i like to watch hotbird on internet , there are web sites like watchwtv.com . Hot bird is the best sat than other free to air.